Gold's Gym Olympic Weight Set Review 2019 - Enough to Get Started? You would find that the vast majority of weight benches do not come with any weights. The Gold’s Gym Olympic weight set will go perfectly with any Olympic bench or for any other exercises that don’t require a bench. If you still haven’t decided upon a bench, then check out our best Olympic workout benches. Need more weight? Since the Gold’s Gym Olympic weight set weighs a total of 110 lbs, we understand that this may not be enough for many users. A great alternative would be the USA Sports Olympic Weight Set which comes at a total weight of a massive 300 lbs! This Gold’s gym olympic bar is made of cast iron, making it heavy duty. 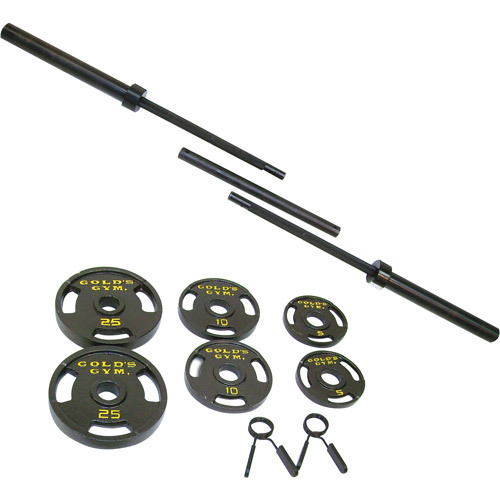 Comes with 7 foot olympic bar, 2 x 25 lb weights, 2 x 10 lb weights, 2 x 5 lb weights and 2 x spring clips. Can be used with any olympic bench that supports a 7 foot bar such as the Gold’s Gym Olympic Bench. Used for various exercises including: Bench press, shoulder press, squats and bicep curls. Combined weight of the bar and all weights is 110 lbs, the bar weighs 30 lbs. 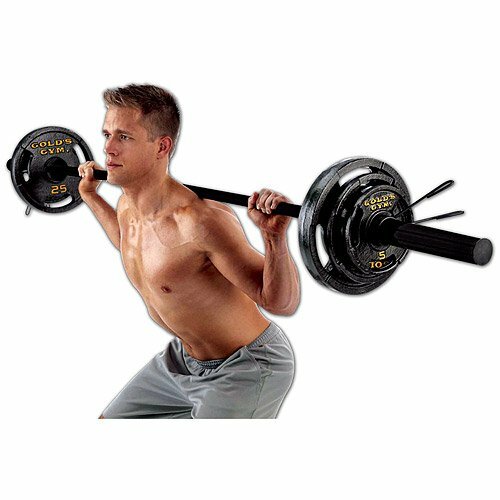 This Gold’s gym weight set comes with enough weights to get started if you’re a beginner, as 110 lbs would be enough for most beginners. If you require more weights, you can just purchase more Gold’s Gym Weight Plates. Works out to be cheaper by purchasing this olympic bar with weights as a set. Olympic bar comes in three separate parts which connects together to make the olympic bar, it’s still a strong bar but not as strong as the Body Solid Olympic Bar which comes all moulded together. This olympic bar will be sufficient for most people however technically this bar is not a proper olympic bar because the weight of an olympic bar is 44 lbs (20 kg) whereas this bar weighs 30 lbs. This shouldn’t be an issue for most people, as long as you know how much the bar weighs then you will still know how much you are able to lift. If you are however looking for a more heavy duty barbell that weighs 44 lbs then you should consider the Body Solid Olympic Bar but you have to buy the weight plates separately. Get the most out of the Gold’s Gym Weight Set as you can use it for various exercises. A lot of people would probably only use it for bench press whereas it is also used for shoulder press, bicep curls, barbell shrugs, squats and also Clean and Jerk but you want to make sure you’ve nailed the technique if you’re planning to go heavy with the clean and jerk.